In a previous post I noted the claim that 7% of all human beings who ever lived are alive today. I’m not happy with that statistic. It’s hard to measure population today, much less in pre-industrial times, and essentially impossible in Paleolithic times. Yet the total number born is really sensitive to how many people were alive in the 200,000 years since homo sapiens arose. Say that there was a static population of 10,000,000 people, who each lived for 40 years. Then there would have to be a birth rate of 250,000 people a year, making 50 billion over 200,000 years. But if there were only 1,000,000 people, with an average life span of 30 years (perhaps more realistic), then the prehistoric number born drops to 6.7 billion. And that’s not even getting into things like the Toba Catastrophe, which may have almost exterminated the species 70,000 years ago, when a giant volcanic eruption on Sumatra cooled the climate for decades. Humanity may have dropped to a few thousand people, probably in Africa. We are suspiciously genetically similar, much more so than, say, chimpanzees, which indicates that we have a small number of ancestors in the fairly recent past. The country has grown from about 3 million at the time of the revolution to about 300 million today. If you add up all the people born in the last 220 years, plus the number who have immigrated in that time, you get 545 million of which 472M were born here and 73M immigrated. So a little over half (55%) of all the Americans who have ever lived are alive now. These numbers themselves are dicey. They come from the US Census, but they only really measured population in the 19th century, not number of births or number of immigrants. I took birth rate estimates to find the number of births, and likewise immigration estimates. Those get clearly rougher as you go back further, since no one was registering all the births that happened at home, and people could come into the country regularly without papers. 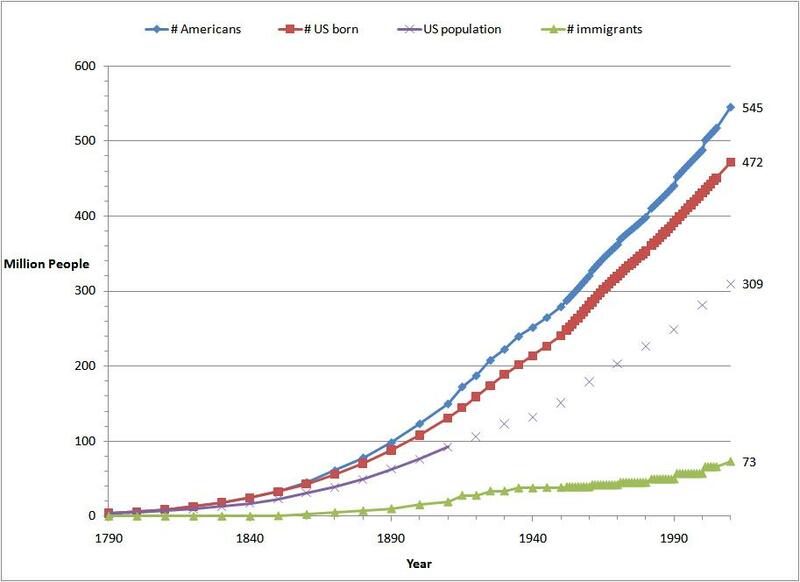 Births and immigration were counted in the 20th century, and those numbers are so much bigger than the earlier ones that it probably doesn’t affect the total. Why does this 55% number matter? I’d say that it’s rather interesting by itself, but it also shows how strong an effect we have on the land today compared to previous times. The US has been around for quite a long time, longer than maybe a dozen other nations, but the massive impact of people upon the landscape is happening right now. That’s true of the world as a whole too. We’re now actually changing the composition of the atmosphere, exploiting most of the fresh water, and using most of the arable land. It’s happening now because right now is when the most people are living. This entry was posted in Uncategorized and tagged people-and-numbers. Bookmark the permalink. 10 Responses to How Many Americans Have There Been? this type of great informative website. Academic work should have the authors name and, when applicable, credentials. I think this work qualifies. The only thing that is important is his references , in oder to verify his work. If he doesn’t want to be credited that doesn’t change the validity of what he has contributed. Appreciation to my father who informed me about this website, this weblog is in fact awesome. There were “Americans” (i.e., human beings who were born, lived, and died in what we now refer to as “America”) for thousands of years before 1790. What about them? It’s certainly true that there were a fair number of people in what’s now the geographic extent of the US both before its formation and before its expansion. California and Texas, for instance, had substantial populations before they joined the Union. Substantial, but unknown! It’s already impossible to count births and immigration in the 19th century in the official US, never mind in outlying territories. Even so, they’re likely to be far less than that of the 20th century, and so wouldn’t affect the totals much.